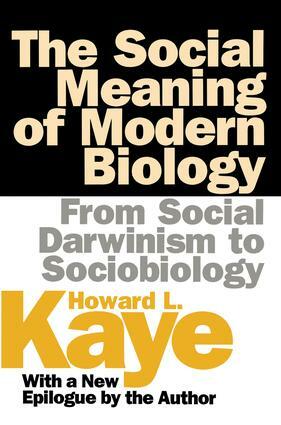 The Social Meaning of Modern Biology analyzes the cultural significance of recurring attempts since the time of Darwin to extract social and moral guidance from the teachings of modern biology. Such efforts are often dismissed as ideological defenses of the social status quo, of the sort wrongly associated with nineteenth-century social Darwinism. Howard Kaye argues they are more properly viewed as culturally radical attempts to redefine who we are by nature and thus rethink how we should live. Despite the scientific and philosophical weaknesses of arguments that "biology is destiny," and their dehumanizing potential, in recent years they have proven to be powerfully attractive. They will continue to be so in an age enthralled by genetic explanations of human experience and excited by the prospect of its biological control.In the ten years since the original edition of The Social Meaning of Modern Biology was published, changes in both science and society have altered the terms of debate over the nature of man and human culture. Kaye's epilogue thoroughly examines these changes. He discusses the remarkable growth of ethology and sociobiology in their study of animal and human behavior and the stunning progress achieved in neuropsychology and behavioral genetics. These developments may appear to bring us closer to long-sought explanations of our physical, mental, and behavioral "machinery." Yet, as Kaye demonstrates, attempts to use such explanations to unify the natural and social sciences are mired in self-contradictory accounts of human freedom and moral choice. The Social Meaning of Modern Biology remains a significant study in the field of sociobiology and is essential reading for sociologists, biologists, behavioral geneticists, and psychologists.